Milford separated from neighboring Amherst in 1794. Like most towns named Milford in the United States, its name comes from the fact that it grew around a mill built on a ford—in this case on the Souhegan River. Milford was once home to numerous granite quarries, which produced a stone that was used, among other things, to make the pillars for the U.S. Treasury in Washington, D.C.—pillars that can be seen on the back of the American $10 bill, although it is unclear whether that will remain after the bill is redesigned. Its nickname remains "The Granite Town", although only one small quarry is in operation as of 2017. Like many New England riverside towns, Milford developed several thriving textile mills in the 19th century. That industry left New England by World War II, but Milford remains the commercial and retail center for surrounding towns. Major employers included casting company Hitchiner Manufacturing Co., a metal cable manufacturer, Hendrix Wire and Cable Inc., and a contract manufacturing solutions company, Cirtronics Corporation. In 2018, local firm Alene Candles became one of the first companies in the state to implement a "conscious leadership" program in a manufacturing production setting. Milford is home to the Milford State Fish Hatchery. The town also holds the Souhegan Valley Boys & Girls Club, built on the former home of the now-bankrupt private theater American Stage Festival. Milford was a stop on the Underground Railroad for escaped slaves. It was also the home of Harriet E. Wilson, who published the semi-autobiographical novel Our Nig: Or, Sketches in the Life of a Free Black in 1859, making it the first novel by an African-American woman published in the country. Officially designated Union Square, the Milford Oval is neither square nor oval in shape, but rather triangular. The "square" name in American parlance denotes a town common irrespective of geometry, and the "oval" name dates from the 19th century, when it was oval in shape. The Oval is the town center, with the Pillsbury Bandstand as its centerpiece and the Souhegan River as backdrop. The Oval is formed by a modified traffic rotary in which State Highways 13 and 101A intersect, with northbound 13 and eastbound 101A passing straight through and crossing each other at a right angle with a stop sign for traffic on Route 13. For many years, the Oval's traffic flow was treated as a series of three individual intersections of three one-way streets, resulting in the unusual arrangement whereby vehicles entering the Oval had right-of-way over vehicles turning left to continue through the Oval. This treatment was reversed in the 1980s to conform with traffic rotary norms whereby vehicles already in the Oval have right-of-way over vehicles entering the Oval. According to the United States Census Bureau, the town has a total area of 25.3 square miles (66 km2), of which 25.2 sq mi (65 km2) is land and 0.1 sq mi (0.26 km2) is water, comprising 0.24% of the town. Milford is drained by the Souhegan River. The town's highest point is near its western border, on the summit of Boynton Hill, at 814 feet (248 m) above sea level. Milford is bordered by Lyndeborough and Mont Vernon to the north, Amherst to the east, Hollis to the southeast, Brookline to the south, Mason to the southwest, and Wilton to the west. As of the census of 2010, there were 15,115 people, 5,929 households, and 4,004 families residing in the town. There were 6,295 housing units, of which 366, or 5.8%, were vacant. 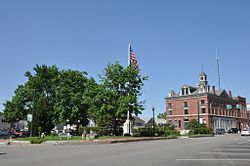 The racial makeup of the town was 94.8% white, 1.3% African American, 0.2% Native American, 1.3% Asian, 0.01% Native Hawaiian or Pacific Islander, 0.6% some other race, and 1.7% from two or more races. 2.2% of the population were Hispanic or Latino of any race. Of the 5,929 households, 35.7% had children under the age of 18 living with them, 52.0% were headed by married couples living together, 10.5% had a female householder with no husband present, and 32.5% were non-families. 25.3% of all households were made up of individuals, and 9.4% were someone living alone who was 65 years of age or older. The average household size was 2.53, and the average family size was 3.04. In the town, 25.0% of the population were under the age of 18, 7.8% were from 18 to 24, 27.0% from 25 to 44, 28.3% from 45 to 64, and 11.9% were 65 years of age or older. The median age was 39.0 years. For every 100 females, there were 95.8 males. For every 100 females age 18 and over, there were 93.3 males. For the period 2011-2015, the estimated median annual income for a household was $64,576, and the median income for a family was $80,241. Male full-time workers had a median income of $55,313 versus $38,792 for females. The per capita income for the town was $32,918. 5.8% of the population and 3.7% of families were below the poverty line. 8.2% of the population under the age of 18 and 2.7% of those 65 or older were living in poverty. The town is known for its "Pumpkin Festival" which is normally held in early October. It is held over a three-day weekend (Friday-Sunday) and attracts more than 35,000 people. The festival has many attractions including food vendors, music stages, craft fair, carved pumpkin lighting, a haunted trail, a beer and wine tasting and a fireworks display around the Oval. Harriet E. Wilson, considered the first female African-American novelist, as well as the first African American of any gender to publish a novel on the North American continent. ^ Coolidge, Austin J.; John B. Mansfield (1859). A History and Description of New England. Boston, Massachusetts. p. 580. ^ Cote, Mike. "Mike Cote's Business Editor's Notebook: Bringing high-end training to the workplace". Union Leader. Retrieved 2018-07-17. ^ Seiler, Paul Steven (2013). "Hendrix Covered Conductor Manual" (PDF). Western Power. p. 7. ^ Veasey, Michelle (2017-05-10). "Cirtronics Wins Award for Corporate Social Responsibility Practices". MassTLC - Mass Technology Leadership Council. Retrieved 2018-07-17. ^ Houghton, Kimberly (July 15, 2018). "Milford candle company embraces conscious leadership". Union Leader. Retrieved 2018-07-17. 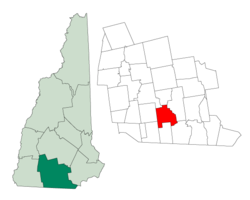 ^ "New Hampshire Wildlife Management Areas". New Hampshire Fish and Game Department. Retrieved 2018-07-17. ^ a b c "Profile of General Population and Housing Characteristics: 2010 Census Summary File 1 (DP-1): Milford town, Hillsborough County, New Hampshire". American Factfinder. U.S. Census Bureau. Retrieved November 2, 2017. ^ "Selected Economic Characteristics: 2011-2015 American Community Survey 5-Year Estimates (DP03): Milford town, Hillsborough County, New Hampshire". American Factfinder. U.S. Census Bureau. Retrieved November 2, 2017. ^ "Milford Pumpkin Festival 2015". Milford Pumpkin Festival. This page was last edited on 15 November 2018, at 14:10 (UTC).